OAMARU FORCE (AUS) (Chestnut 1997-Stud 2003). 6 wins to 1100m, AJC Shorts H., Gr.3. Sire of 139 rnrs, 85 wnrs, inc. SW Mid Summer Music (BRC Stradbroke H., Gr.1), Diplomatic Force, Rocking Force and of The Big Dance, Waitaki River - Good Words (H.K. ), Rylea Lass, Core Breach, Fairy Twins, Oamaru Owl, Force of Three, Grand Vision, Tabasco Force, Gracie Louise, Lisa Fashionista, Oamaru Princess, Oamaru Rose, Ogunde, Ben Zena, Blossom Daily, etc. BEL FRANC, by Bel Esprit. 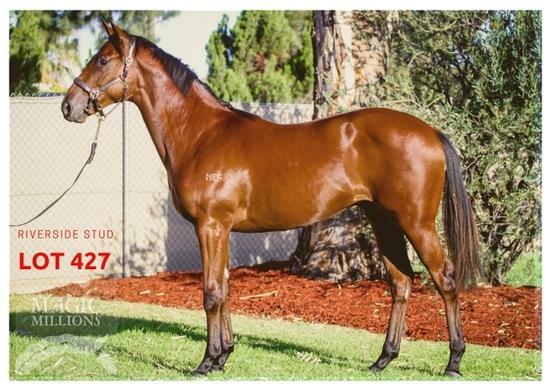 Winner at 2, SAJC Spring Gully Fulham Park 2YO P. This is her fourth foal. Her third foal is a 2YO. Dam of one foal to race. Bel Franc. Winner. See above. Thankgodforfranc. 7 wins-1 at 2-to 1550m to 2016-17 in Aust. Hat Check Girl. Placed at 2 in Aust. WESTERN RED (Spectacular Love). Joint Head of The 1993-94 NZ 3YO Free H. 7 wins-1 at 2-from 1200m to 2000m, NZ$162,600, A$300,120, Waikato Draught Sprint, Gr.1, STC Canterbury Guineas, Gr.1, Avondale Guineas, Gr.2, VRC Rising Fast H., ARC Matol KM H., Waitemata H., Ford Laser Juvenile, 2d Levin RC Bayer Classic, Gr.1, VATC JJ Liston S., Gr.2, ARC Cadbury Confectionery Sprint S., Avondale JC Coca-Cola H., 3d VRC Nissan S.H., Gr.1, ARC King's P., L, VRC Lavazza H., VATC CUB Welter H., 4th STC Tulloch S., Gr.2, ARC Great Northern Foal S., Gr.3. Sire. Ready for Sure. 2 wins at 1200m, 1600m, WATC Westspeed H., 2d WATC Carpets by Design H., 3d WATC Tabtouch.com.au H.
Holson. 7 wins at 1050m, 1300m in Macau. Don't Tell Linda. 4 wins at 1100m, 1600m in Aust. Lady Jinx. Winner at 1100m in Aust. Haworth. Winner at 1200m in South Africa. Johnny Rotten. Winner at 2050m in NZ. Posh Lady. 3 wins at 1600m, 2200m, Otago RC Bunker at Prebbleton Farm H., 2d WRC Quest Till Systems H.
Ryans Lady. Winner at 1350m in NZ. Perculator - Ever Win (H.K.). 4 wins from 1600m to 2000m in NZ and HK, HKJC Deauville H., Pok Po Wan H.
Allo Allo - Symphonic (H.K.). 3 wins-1 at 2-at 1050m, 1350m in NZ and HK, HKJC Admiralty H., North Point H.
Kiwi Piper. 5 wins to 1200m in Aust. Lady Bronte. 4 wins. See above. Scratch 'n' Win. 5 wins from 1600m to 2150m, BOP RC Bennett Gibson Group H., CJC Race Images H., 2d ARC Dunstan Stayers Championship Qualifier, 3d ARC Anton's Seafood H., Dunstan Stayers' Qualifier, Avondale JC Mondiale Freight H., CJC Fitzgerald Arms H.
Danni Jay - Gotta Make It (Mal.). Winner at 1400m in Malaysia. Second Duty (Hermes). 8 wins from 2000m to 2200m, Manawatu Autumn H., Manawatu RC BBA & Partners Thormanby H., 2d Manawatu Cup, Gr.3. Loose Talk - Noble Action (Mal.) (Copenhagen II). 7 wins-3 at 2-to 1500m in Aust. and Malaysia, Adelaide RC Parklands H., PARC Glenacres Stud H., 2d Singapore TC Lion City Cup, L.
Second Choice. 7 wins from 6f to 11f, Feilding JC Manchester H.
Artful Dodger. Winner at 1200m, 3d BATC Novice H. Producer. Sardaaj (Iffraaj). 2 wins at 1200m, 1400m, NZ$80,435, A$20,000, Waikato RC On the Lawn H., 2d WRC Levin Classic, Gr.1. Sea Spray (Von Costa de Hero). 3 wins at 1100m, 1400m, A$239,375, MRC Yellowglen P., 2d VRC Lexus Hybrid P., L.